Yale junior Kristo Ment is making waves, literally. As we sat down for an interview, he drew the arc of a light wave with his right arm, coming at us from a hypothetical supernova—a celestial explosion. He stretched the wave out, demonstrating a redshift: the shift of light from space towards longer wavelengths due to the expansion of the universe. After high school graduation, Ment moved to New Haven and decided to pursue an astrophysics major at Yale. He described the transition as gratifying because it allowed him to explore a new region of the world. “This idea of starting over from zero is something that I found incredibly exciting,” said Ment. Since the new beginning, Ment has made discoveries almost every day and developed a passion for astrophysics. After taking intensive introductory courses in Physics, Ment sought the mentorship of his professor Charles Baltay. The summer after his freshman year, Ment worked with Baltay studying pulsating stars called RR Lyrae variables, which reveal the distances between galactic bodies. Ment now works with Baltay studying redshifted light from supernovae. He examines data from explosions occurring close to Earth in astronomical space and time. These nearby supernovae, when compared to high-redshift supernovae that are further away, help to illustrate how the universe is expanding and how light is stretched. At a January conference in Paris, Kristo Ment ’17 presented a microlensing database to a community of scientists involved in the pursuit of detecting planets. Image courtesy of Ge.Lefo.net. Ment’s work includes long hours of sitting behind the computer, coding programs, and analyzing the data. Contrary to many people’s expectations, Ment does not spend much of his time looking through a telescope. Still, one new, high-capacity telescope excites him: NASA’s Wide-Field Infrared Survey Telescope (WFIRST). From space, the telescope will survey millions of galaxies and detect thousands of supernovae. “WFIRST will be the best telescope we have ever sent to space,” Ment said. Ment is excited by WFIRST’s potential to detect not only supernovae, but also planets by microlensing. Microlensing relies on gravity’s effect on light; if light from a distant source is bent or distorted by a star’s gravity—especially if the star has a planet orbiting around it—then the telescope will display a huge brightening of light. Since scientists use different telescopes and models all around the world, Ment saw a need to consolidate the information about microlensing from various sources. 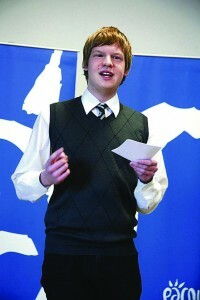 During the summer after his sophomore year, Ment worked at Heidelberg University in Germany to compile an online database. In January, he presented his work to 100 members of the international microlensing conference. He said that they have already found dozens of planets, and he hopes they will find even more using his database. In the future, Ment wants to continue looking for planets but does not yet know which method he will use. He might use microlensing, WFIRST, or another method devised by astronomers. For example, the radial velocity method capitalizes on the “wobbling” of stars caused by the gravity of revolving planets, and another method, called transit photometry, measures how light decreases when planets pass in front of stars. Regardless of the way he proceeds, Ment has already come a long way from his hometown. The junior in Morse College has many responsibilities. He is currently enrolled in three graduate-level astrophysics classes, French, and Ancient Roman history—all of which he enjoys. Sometimes, however, he obsesses over the details of homework and research and wants to slap himself: “I wake up almost every morning feeling like a masochist,” he said. Currently enrolled in three graduate-level astrophysics classes in addition to studying French and Roman history, Ment sometimes questions his own sanity. “I wake up almost every morning feeling like a masochist,” he said. Nevertheless Ment considers himself lucky to be at Yale. Its diverse community and resources have allowed him to expand his ambitions, passions, and expertise.